Purchasing a home is one of the biggest investments a person will make during their lifetime. With what you’re putting on the line, it’s important that no stone is left unturned and no detail is overlooked. Before making an offer on what you may believe is the home of your dreams, take advantage of Microsoft’s home inspection checklist. With the home inspection checklist, you can look over every factor and aspect when considering purchasing a home. The Microsoft home inspection checklist is instantly downloadable for free. Simply click the link to get started. The home inspection checklist from Microsoft that is available on this page is one of the most comprehensive you will find on the web today. The home inspection checklist comes in the form of a Microsoft Word document, so it’s easy to use, read and understand. The checklist is also printable and completely customizable. If you don’t need to make any changes to it, simply print it off immediately and you’re ready to go. It’s important to note that the home inspection checklist is not a substitute for a licensed and qualified home inspector. 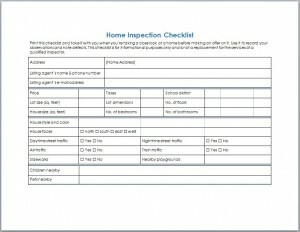 The first page of the home inspection checklist is for basic information about the home, including the address, listing agent’s name and phone number, price, size and style. The second page is a continuation of the first and includes age and condition of such things as the plumbing, heating and air conditioning. As you go through the home inspection checklist, simply use the letters from the key in the corresponding boxes. You will repeat this process when looking at the home’s exterior, kitchen, bedrooms, bathrooms, fireplace, hot water heater, heating and cooling system, and furniture. Keep the experience of buying your dream home from becoming a nightmare with the home inspection checklist from Microsoft. Download the checklist for free today!